It appears Chael Sonnen is making quite the impression with his articulate and entertaining smack talking ways. While former top contender Vitor Belfort remains on the mend from shoulder surgery, his striking coach Shawn Tompkins believes Sonnen is barking up the wrong middleweight tree by going after Anderson Silva. 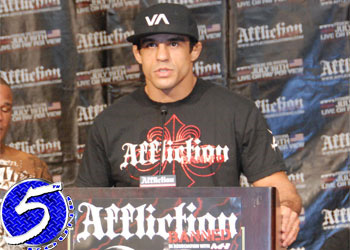 “The Spider” was expected to face Belfort at UFC 112 prior to the shoulder injury. This September will mark a year since Belfort returned to the Octagon to post a devastating UFC 103 knockout victory over Rich Franklin. That is true, you can’t argue against numbers … but you can always bet on them. The Gambling Gods have pegged Silva as a 4-to-1 favorite to retain his strap. While the powers that be profess it will be an easy night for Silva, Belfort isn’t about to jump on anyone’s bandwagon. Belfort’s coach, on the other hand, was a bit more vocal about who he preferred to reign supreme inside Oracle Arena in Oakland, CA. “It’s not personal, but it’s a little more personal (with Silva),” Tompkins said. “I think Chael will try to pick a fight, but that’s the only way he becomes popular or famous because we all know he’s a boring fighter. Anderson is the man and we want to beat that man. I think that fight would mean a little more to us.